The different ways to create “happy real estate” was a hot topic at the recent Happy Cities FIABCI World Real Estate Congress in Dubai. While delegates concurred that happiness largely comes from within, the community one chooses to live in plays a major role in enhancing wellbeing. “Understanding who you are, your own core values, what we find important, we extract that out of our environment to live as authentically as possible in that environment. So that has to be compatible,” says Tarek Qaddumi, principal architect at TNQ Architects and Engineering Consultants. In practice, the basic human need to interact with each other, as well as nature, are met by the inclusion of parks and play areas in communities, says Tim Garret, CEO of HR’s Corporate Wellness Toolbox. One of the supposed hurdles of building such sustainable and happy communities is cost, but some analysts point out that integrating natural elements, such as light, healthy air and water, within a building doesn’t have to be costly. According to Paul Scialla, founder of the International Wellbeing Institute, the incremental cost of meeting well-being standards is less than a 1 per cent premium on normal construction cost. Dubai developments such as Jumeirah Golf Estates (JGE), Town Square, The Sustainable City and Al Barari are among projects that are deliberately incorporating such wellbeing elements. 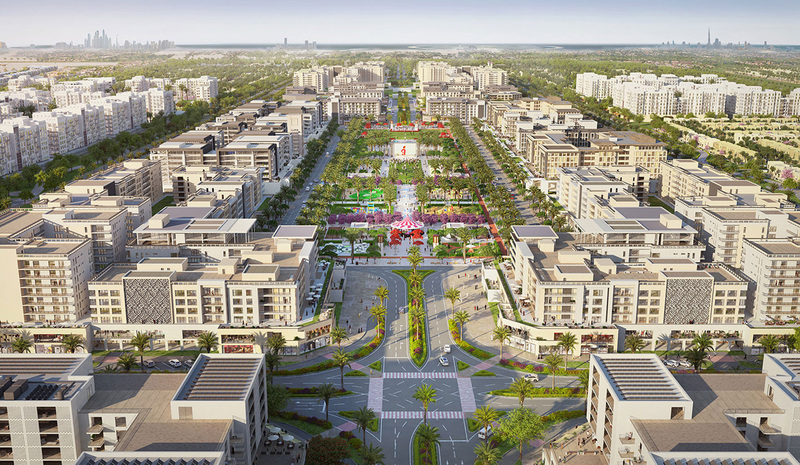 The Sustainable City has been named “Happiest Community” at the annual Gulf Real Estate Awards. Creating communities with plenty of greenery, think Emirates Living, as well as integrating life into façades of buildings, think Downtown Dubai, is not new to developers here, but some have taken it further than others. Around 75 percent of the community is nature, with some 15 lakes and over 4,000 trees. It attracts more than 340 types of birds, and the golf courses, jogging tracks, tennis academy and gyms promote a healthy and social lifestyle. Nshama’s Town Square is another community that adopts the happy community concept. The 750-acre development, which was launched just over three years ago, now has a thriving town house community, named Zahra. It features a public recreational park, complete with basketball courts and a skate park.